Brooklyn, a three-year-old American bulldog, got trapped in tunnels underground after he chased a wombat down the holes. 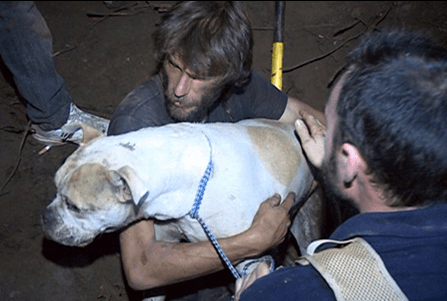 It was a communal effort as the local residents of the Shoalhaven community in Nowra, New South Wales, Australia, came together with shovels and ropes to rescue the dog who got stuck in a wombat hole after emergency services called off the rescue operation. Emergency services had tried to locate and dig out the dog but had to call off the official search after they came to the conclusion that there were “no longer any signs of life,” leaving the live dog trapped.